expensive Health World VLA system which is priced at $5995 + gst and does SO MUCH MORE! 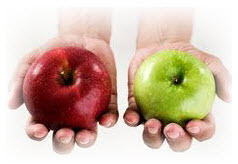 How do the HealthQuest BIA and the Metagenics VLA Compare? The HealthQuest BIA system allows you to track your patient's progress in terms of centimeters and kilograms lost during the course of their treatment program. The program not only calculates the total cms and kgs lost but also the average loss of each per week. These results are highly motivating for your patients and help spur them on to further success. The ratios of Waist-to-Hip and Waist-to-Height measurements have been shown in scientific studies to be very good predictors of the risk of cardiovascular disease and stroke. Even more accurate than cholesterol readings! 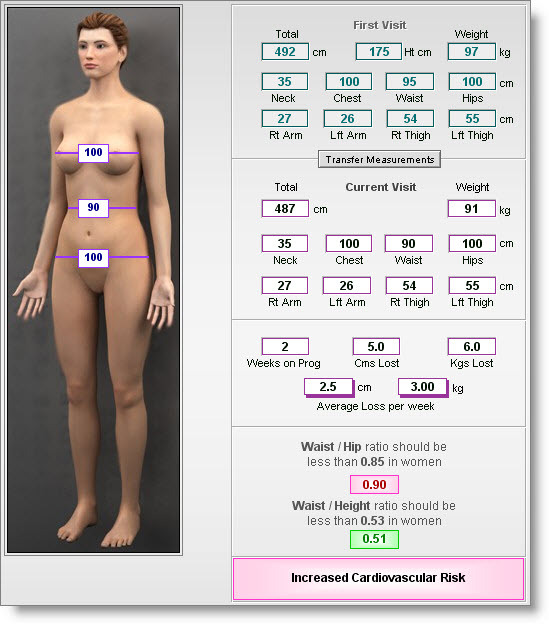 HealthQuest performs these calculations for you and presents the risk level for the patient for these ratios. This rating assesses your physique according to the ratio of body fat and muscle mass in your body. As you become more active and reduce the amount of body fat, your physique rating will also change accordingly. Even though your weight may not change, your muscle mass and body fat levels may be changing making you healthier and at lower risk of certain diseases. You should set your own goal as to what type of physique you would like to have and your diet and fitness program will then be designed to meet that goal.  Body fat % – Too much or not enough fat?  Segmental Body Fat % - Measurement of each arm, each leg and trunk area. 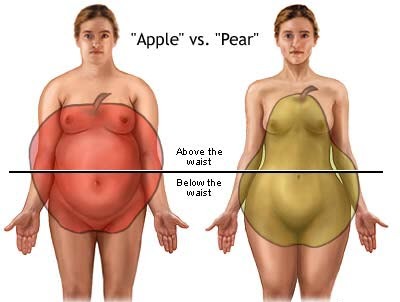  Visceral Fat Rating - Visceral fat surrounds the internal organs in the stomach/trunk area of your body. Ensuring you have healthy levels of visceral fat reduces the risk of certain diseases such as heart disease and high blood pressure and delays the onset of type 2 diabetes. Monitoring your results can help you adjust your lifestyle to stay in the low risk range.  Bone mass - Indicates the weight of bone mineral in the body. The development of muscle tissue has been shown to encourage stronger, healthier bones. It is important to develop and maintain healthy bones through plenty of exercise along with a range of bone building nutrients.  Basal Metabolic Rate - Indicates the number of calories your body burns when at rest. Unlike other methods of calculating BMR, InnerScan takes the amount of muscle in your body into account, giving a more accurate picture of your dietary requirements. Your BMR will tend to decrease as you get older - you can help prevent this through a regular routine of cardiovascular exercise and increased activity.  Metabolism Age - Your Basal Metabolic Rate starts to decrease after the age of 17 and the metabolic age rating indicates what age level your body is currently rated at. Aim to keep young!  Muscle Mass - Calculates the weight of muscle in your body. Do you have too much or not enough muscle?  Segmental Muscle Mass Measurement of each arm, each leg and trunk area. 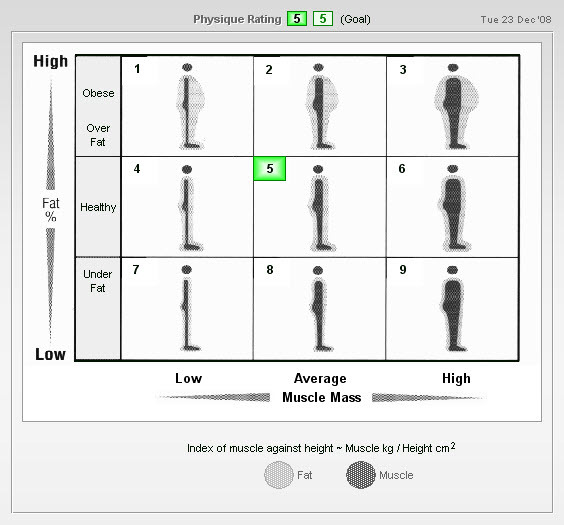  Physique Rating - Describes your overall physique or body shape by examining the balance between the amounts of body fat and muscle in your body.  Athlete Mode - For people who do more than 10 hours a week intense exercise and who have a resting heart rate of fewer than 60 beats per minute. The user stands on four foot plates on the platform of the scale and holds the hand electrodes that are conveniently housed in the base using retractable connecting cables. The monitor will then send a safe low dual frequency electrical signal from the 8 hand and foot plate electrodes through the body. The results of the measurements (known as Bio-electrical Impedance Analysis or BIA) are then fed into a very advanced computer within the monitor which then provides accurate and personalised body composition readings. This method enables the user to obtain more in-depth information regarding their body composition such as muscle mass, fat mass, visceral (abdominal) fat level, bone mass, metabolic rate and physique rating. How Accurate are our Monitors? The current model's Bio-Impedance measuring system and the inbuilt computer's calculation program is based on the result of over 50,000 client tests conducted in centers throughout Japan. Its accuracy is unsurpassed by any other currently available system. Our system is highly accurate - it is the only system on the market that has been independently tested in comparison to DEXA (dual-energy x-ray absorbiometry) which is generally considered the gold standard due to its reliability and precision. The BIA monitor was found to be within 2% of DEXA* readings. This is a great result for our low cost and very convenient system. *Dual-emission X-ray absorptiometry - DXA or DEXA - is used for Body Composition Analysis in hospitals and is extremely accurate. Two X-ray beams with differing energy levels are aimed at the patient's body during the scan. Dual-energy X-ray absorptiometry is the most widely used and most thoroughly studied body composition and bone density measurement technology. The cost of a DEXA scan varies from $250 to $350 ... the cost of a consult and BIA scan is way below that, so you clients will really love saving money as well !! In comparison to other competing products, independent research has shown that as the full weight of the patient presses down on the four foot pads ensuring better contact, more accurate results are obtained than by the wrists and ankle strap contacts used by other systems. 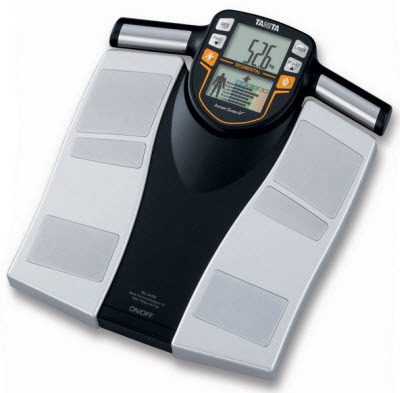 Unlike other systems, they measure the weight of the patient, visceral fat and provide bone mass readings as well. 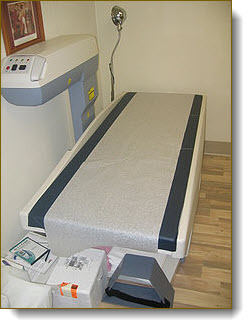 Because the patient does not have to lie down, tests can be performed very quickly in whatever spot you find convenient  no table is required.